Our latest data shows that Azerbaijan spent $3,078,000,000 on their military in 2012 which amounted to 4.6% of the country's GDP that year. Check out the chart below for more Azerbaijani military budget data. We can only publish the past 12 years, but SIPRI has data as far back as 1988 on their site. 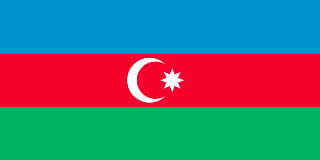 SIPRI Footnote: The figures for Azerbaijan for 2011 and 2012 include allocations of 1087 and 1123 million manats respectively for "special defence projects" in addition to the main defence budget. Army, Navy, Air, and Air Defense Forces. men between 18 and 35 are liable for military service; length of service is 18 months and 12 months for university graduates; 17 years of age for voluntary service; 17 year olds are considered to be on active service at cadet military schools.